Critical Thinking: Will SSA Ever Get The Operating Funds or a Commissioner? Will SSA Ever Get The Operating Funds or a Commissioner? Buried in the recent Omnibus Spending Bill that kept the U.S. government operating is $100 million for the Social Security Administration that is meant, in part, to fix one of the country’s worst but least-understood embarrassments – a multi-year backlog of people waiting to hear if they can get disability benefits. But an Omnibus Spending Bill is not a Budget Bill. The differences may be crucial. 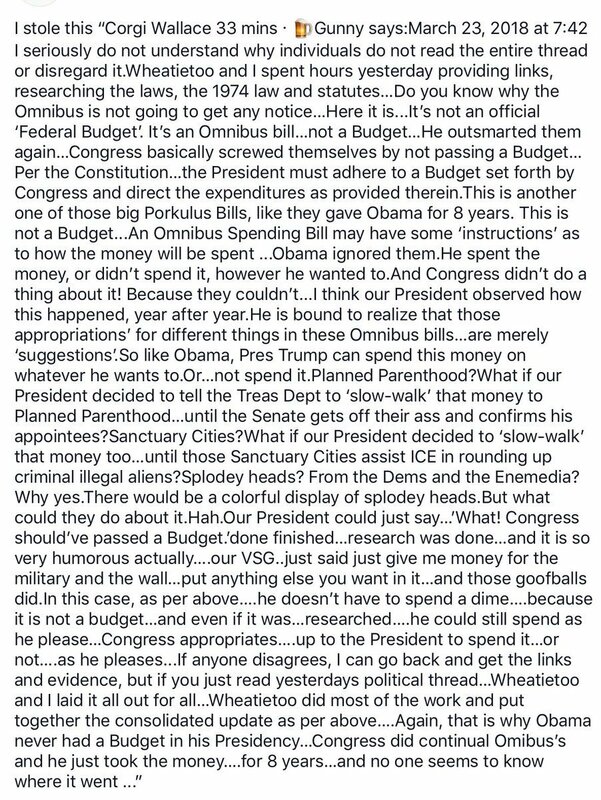 Omnibus Spending Bill is not a "Budget". Trump can spend the funds any way he wants. Hope this was his plan. The Social Security Disability Insurance program is supposed to provide a safety net for people unable to work due to injury or illness. According to the latest SSA statistics, nearly 1 million people remain stuck in a hearing-decision backlog that averages 599 days (20 months). In some cities and states, wait times are up to 772 days. Most of the people in line have already paid for the benefits through their payroll taxes. Yet they remain frustrated by the backlog. The new funds offer the promise that things will finally improve. Maybe the SSA can even beat its own projection that the backlog can’t be significantly reduced for another four years. But it will have to step up its game to make full use of the money. In September 2017 testimony before the House Ways and Means Committee, Bea Disman, acting chief of staff at the SSA, said the agency was implementing several measures to address the massive backlog. But by the end of 2017, almost no progress had been made on reducing the wait times for applicants, making it the worst in the U.S. government. This is not just unseemly; it’s tragic. In 2017 alone, more than 10,000 people died waiting to hear if they would be awarded insurance benefits that they had worked for years to earn – a 15 percent increase over the previous year. There are several factors that have taken the backlog to a crisis level. First, the SSA has been without a Senate-confirmed leader since 2013, which has limited its ability to tackle this and other challenges. President Obama refused to appoint a Commissioner, and neither has President Trump. In addition, the agency has failed to meet its own hiring goal for administrative law judges and support staff who conduct the review hearings, even though it told Congress extra hiring would be a primary tool for reducing the backlog. In fact, only 600 ALJs have been hired over the past three years and only 132 in fiscal year 2017. There is not enough staff to meet the demand. The SSA requires that applicants provide duplicative medical records of various sorts and then states that it’s overwhelmed by the volume of them. Due to SSA concerns about subjectivity and physician bias, the agency also no longer assigns greater weight to the opinions of doctors who treat applicants when assessing an individual’s condition and his or her ability to work. Instead it can choose to rely more on the opinion of its own, more cursory, processes to examine the patients or review medical evidence. The SSA also doesn’t really take into consideration disability determinations by the U.S. Department of Veterans Affairs, state agencies or private insurers. These entities have disability criteria that are different from the SSA, but their programs are similar enough. These determinations can and should inform SSA decisions and help the SSA avoid a “start from zero” process. The new funding is welcome and recognizes there’s a problem. But recent data from the SSA indicate the agency is anticipating a dramatic rise in disability applications in 2018 and 2019. So, this story is far from over. Social Security disability benefits remain a complicated mess with no one at the helm to provide strategic leadership to the staff or to the judges who must assess the claims of former workers and their families. Jim Allsup is chairman and CEO of Allsup LLC, a national disability representation organization and Social Security-authorized Employment Network based in Belleville, Ill.